Brush the pork fillets with a little oil. Sprinkle the Texas BBQ seasoning onto a sheet of baking paper. Roll in the pork fillets in the seasoning and press the seasoning firmly onto fillets. Heat the griddle plate and BBQ over a medium heat and cook pork fillets 4-5 minutes on each side (3 sides). Brush the corncobs with a little oil and grill the corn pieces on the hot grill turning frequently. 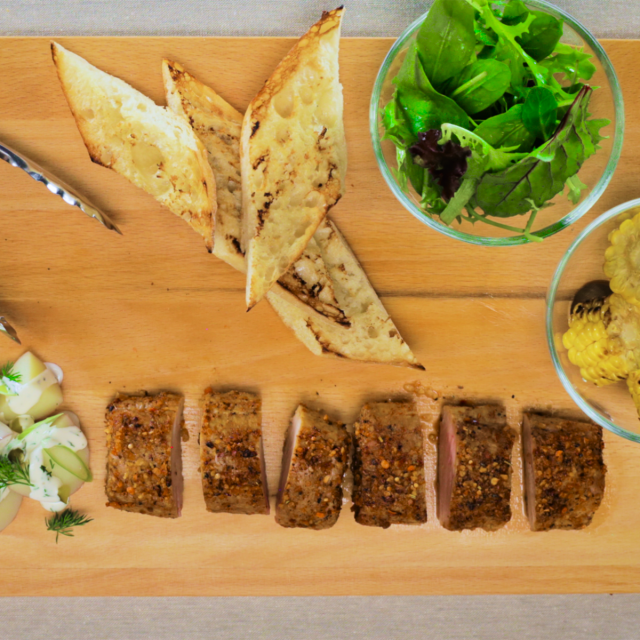 Serve pork fillets sliced thickly with grilled corn, potato salad, toasted flat bread and green salad. Notes: You can make your own Texas BBQ seasoning simply combine ¼ tsp cayenne pepper, 1 tsp ground cumin, 1 Tblsp smoked paprika, 1 tsp oregano, 1tsp toasted onion, 2 tsp salt, 1 Tblsp dill seed. Add dry chilli flakes if you like it spicy.